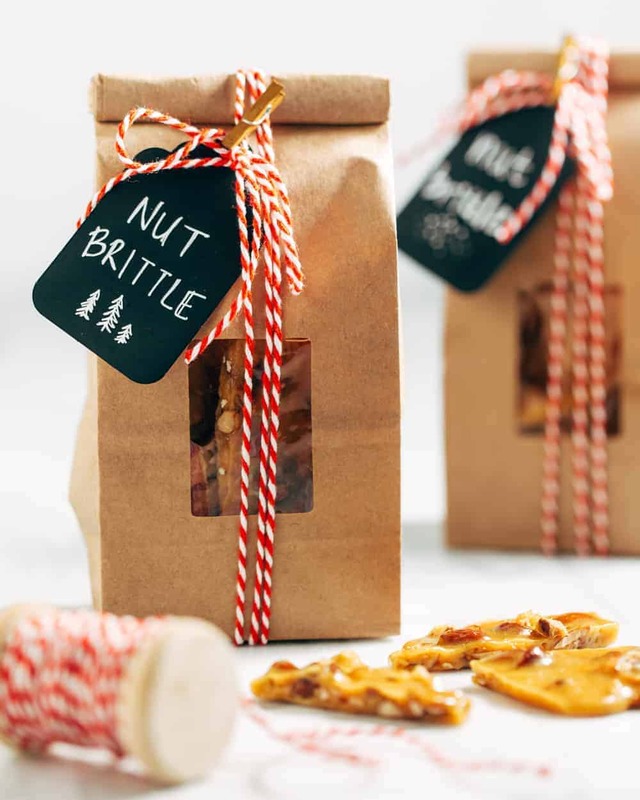 This Nut Brittle recipe uses salted mixed nuts for a delicious twist on the holiday classic. Package this candy up to give as a sweet holiday hostess gift. Is it really the holidays without candy? I know that everyone always talks about making Christmas cookies, and the season doesn’t feel complete without several batches of Peanut Butter Blossoms or Molasses Cookies. But there’s something about candy that really rounds out the holidays. 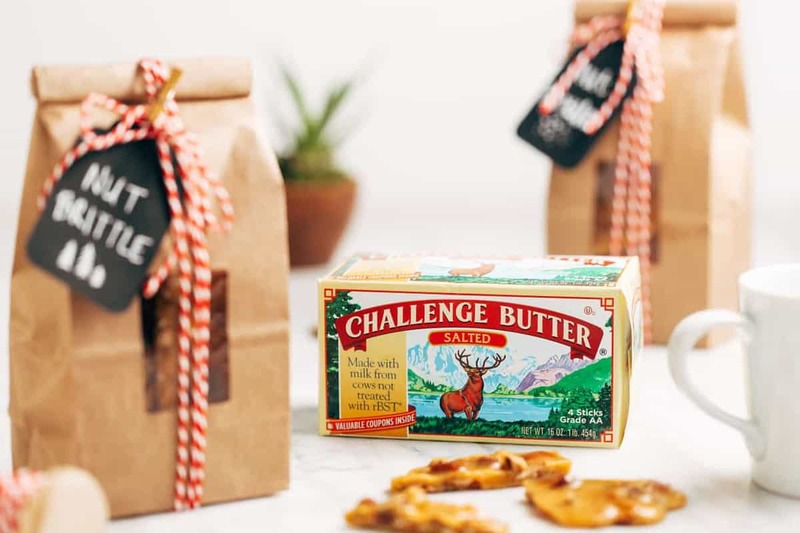 From Turtle Fudge to Homemade Marshmallows to Bourbon Maple Salted Caramels, holiday candies are fun to make and even more fun to package up as gifts. 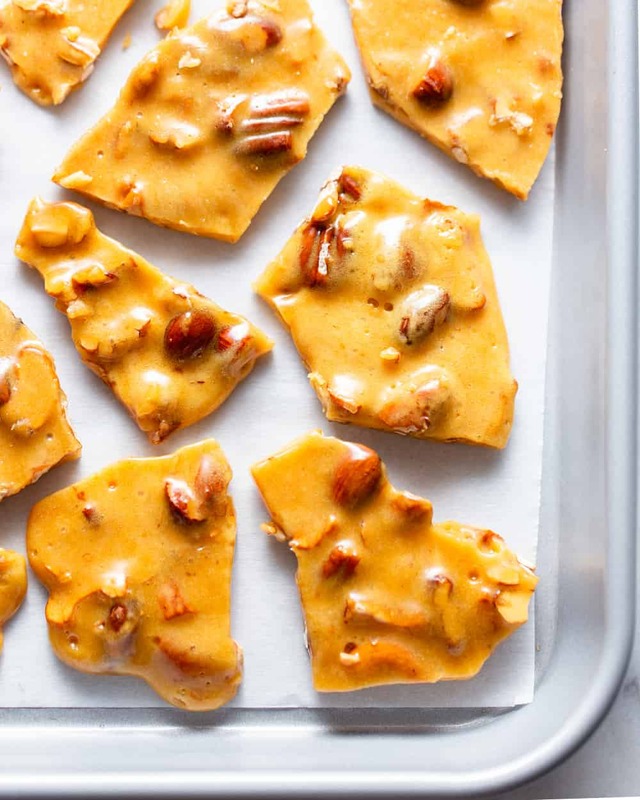 My Nana always had tins of peanut brittle for us to snack on while we baked for the holidays and Nut Brittle still takes me back to those childhood moments of baking with her to this day. 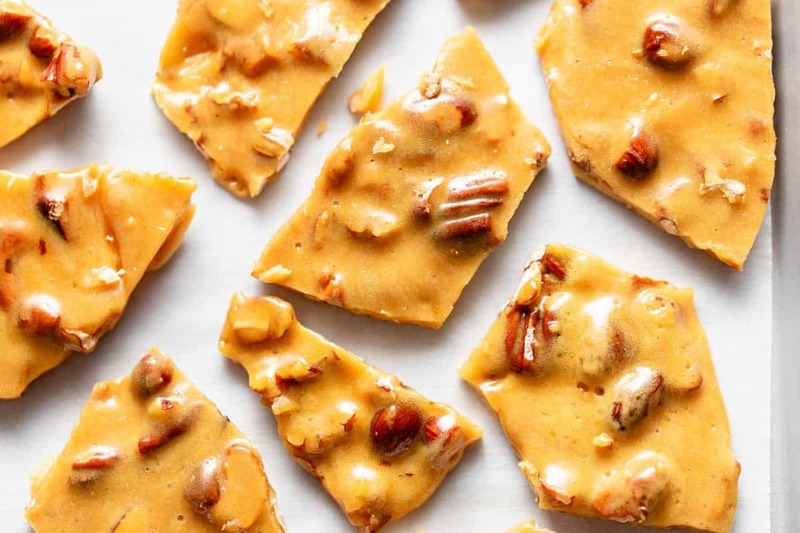 Even though peanut brittle is the classic, you guys know I like to shake things up around here every now and then. So instead of reaching for just peanuts for this Nut Brittle recipe, I reached instead for salted mixed nuts. You can use your favorite mixture to include what you like best. Cashews? Pecans? Walnuts? Almonds? They’re all welcome here – just make sure they’re salted and that you give them a coarse chop to break up any bigger nuts into smaller pieces. 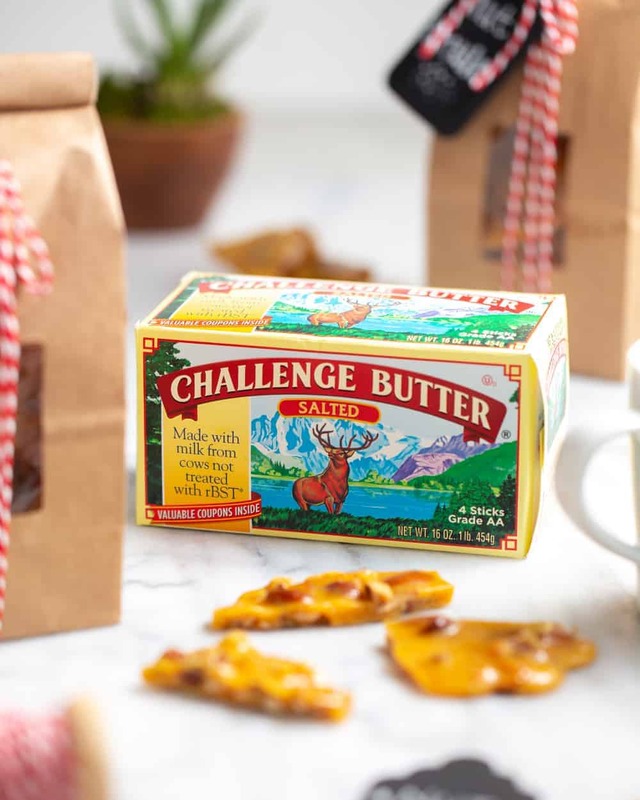 In addition to reaching for a mix of nuts, I also pulled out my favorite Challenge butter to make this Nut Brittle. 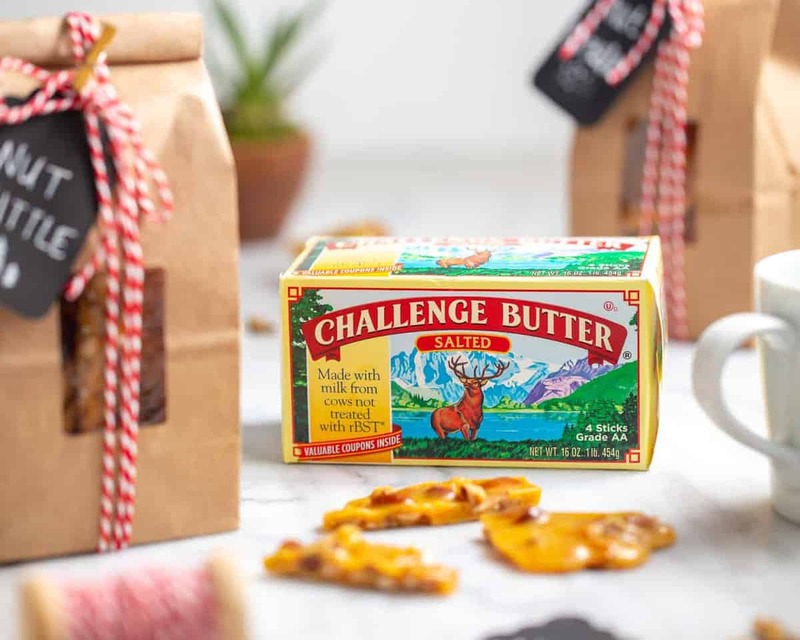 Challenge Dairy has been one of my partners for years because I truly love all of their products – everything they make, from their butter to their cream cheese spreads, is amazing. In fact, they are the only dairy product company that controls the whole process from milking the cows, to transporting milk, to packaging the product. How awesome is that? 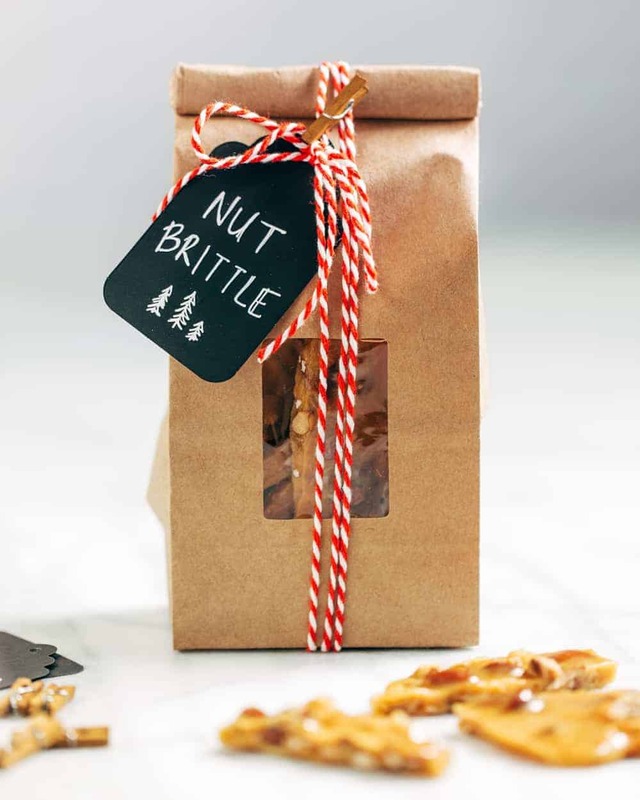 HOW DO YOU MAKE NUT BRITTLE? Candy making freaks some people out, but I’ve got a couple of recommendations to make the whole process easier. First: Please, please don’t skip using a candy thermometer. 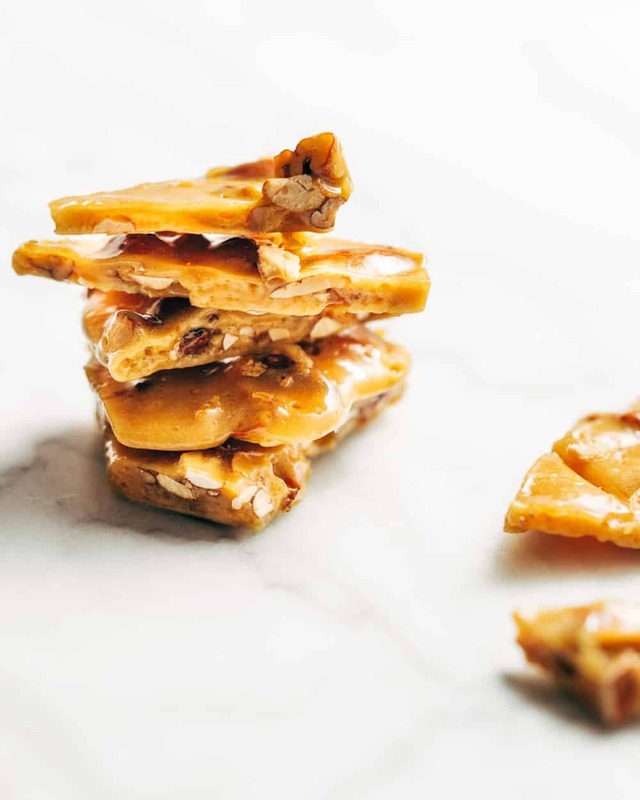 Making Nut Brittle, like any candy, seems to go slowly until it doesn’t. That means that you’ll sit around waiting for the sugar to come to the right temperature and then suddenly – boom! – it’ll be ready for the next step. Using a good candy thermometer will help you keep an eye on the process so you know where it’s at and will help you make sure you don’t over- or under-cook the Nut Brittle. Second: Measure out and organize your ingredients before you start the cooking process. Remember how I said that making Nut Brittle goes slowly until it doesn’t? The final ingredients all get added very quickly at the end, and you won’t have time to measure them out as you add them. Having the butter, vanilla and baking soda ready to go will let you add them as soon as the thermometer reads 300°F. 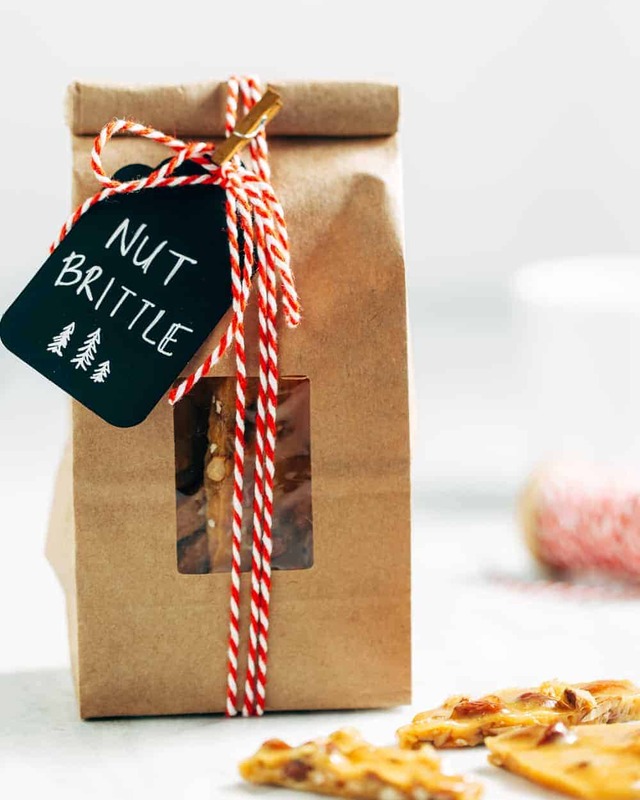 Don’t let making candy intimidate you or stop you from trying your hand at making Nut Brittle this holiday season. 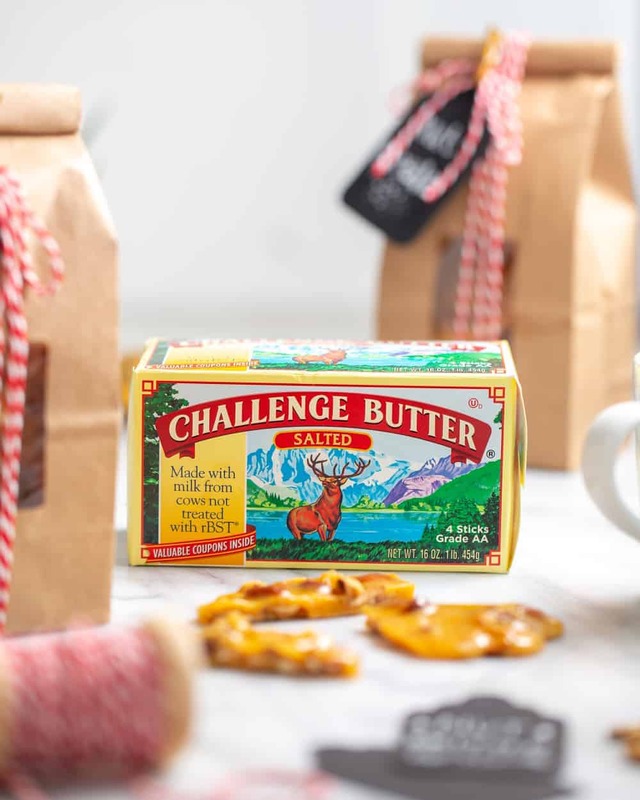 It’s the perfect candy to package up as holiday hostess gifts or to snack on by yourself while you wrap presents. You know what? On second thought, you better make two batches. I think you’re gonna need them. Line a large baking sheet with a silicone baking mat or parchment paper. Set aside. Since this recipe moves quickly, I recommend you measure out and organize your ingredients before you start the cooking process. In a heavy 2-quart saucepan, over medium heat, bring to a boil sugar, corn syrup, salt, and water. Stir until sugar is dissolved. Add in mixed nuts and stir until combined. Place a candy thermometer into the mixture and continue cooking, stirring frequently until temperature reaches 300°F. Immediately remove saucepan from heat and quickly stir in butter, vanilla, and baking soda. Immediately pour the mixture onto the prepared baking sheet. Using a rubber spatula, spread the mixture into a rectangle about 14×12 inches. Snap candy into pieces and store in an airtight container at room temperature.